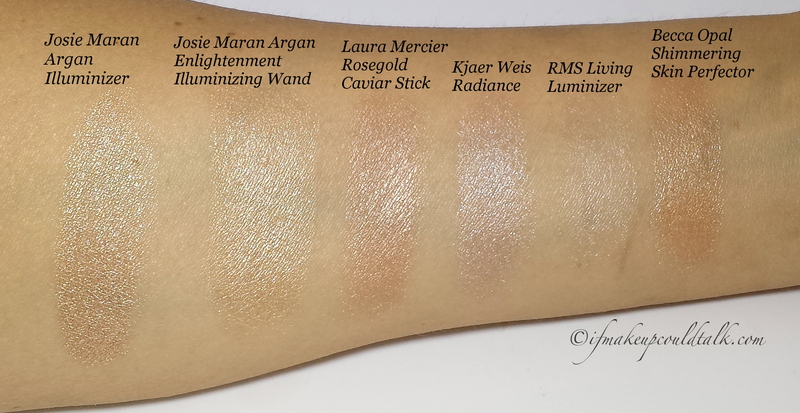 Josie Maran Argan Enlightenment Illuminizing Wand review and comparisons. Admittedly, I am a highlighter/illuminator junkie. I have more than enough of these magnificent beauties in my collection to last several lifetimes. So when a lovely reader inquired about some highlighter recommendations, I inadvertently found myself at Sephora checking-out the new Josie Maran Argan Enlightenment Illuminizing Wand ($28 USD/10.5g). The rose gold packaging, the convenient stick form, and the moisturizing ingredients was too tempting to resist. As you can very well predict, I succumbed to this enchanter’s bewitching qualities and can solemnly declare, I’m in love–yet, again. 🙂 I hope you enjoy. Gorgeous light-colored warm golden shade. Initial application is sheer and can be built-up (without any patchiness) for truly illuminating results. Smooth creamy formula can be applied straight from the tube and blended with fingers or a synthetic brush. The overall finish is radiant without any shimmer or glitter. Pale golden tone is universally flattering–darker skins will not experience ashy results. Pairs beautifully with bronzers for a truly sun-kissed glow. Layers well over liquid and powder foundations. Moisturizing ingredients feel soothing on drier and mature skin. Convenient stick form is ideal for travel and touch-ups. Results last all day on my dry skin (8-10 hours and longer). Reasonable price considering the amount offered. Free of mineral oil, parabens, synthetic fragrances, phthalates, and sulfates. Due to the sheer texture, medium and darker skins will need to apply 2-3 layers for noticeable results. On oilier skins, reapplication is a definite possibility. As with most cream products, this does not fully set–so avoid touching your face throughout the day. Not completely natural or vegan. As you can see from the above swatches, this illuminator definitely does not contain any large particles of shimmer or glitter. The results are refined and appear quite reflective in any light and from any angle. Thankfully, this formula does not deposit a heavy layer of pigment on the first swipe. In fact, this illuminator sheers-out beautifully despite the layers applied. 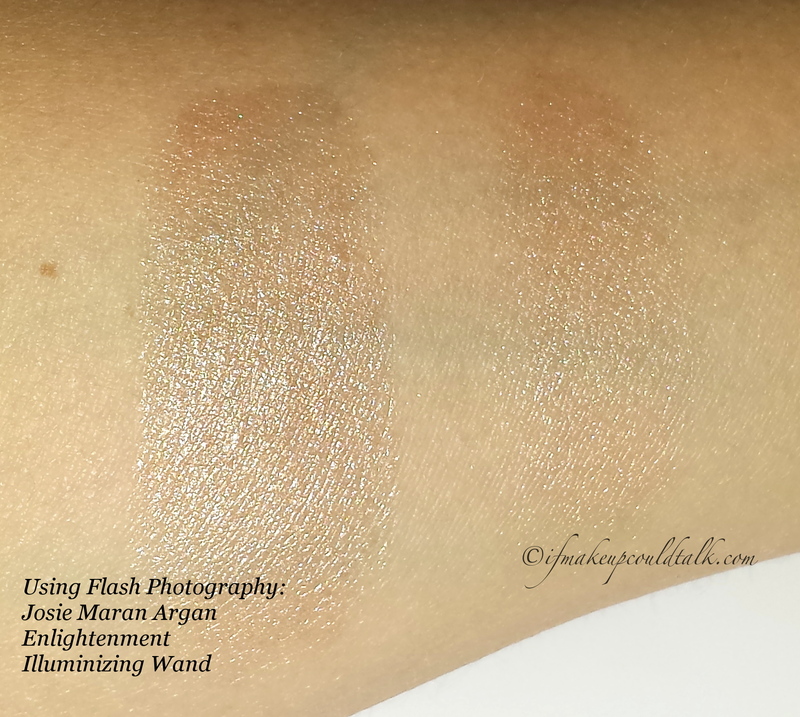 In the photos, the left swatch is what the formula looks like after three passes/layers. The right swatch is one pass blended out. 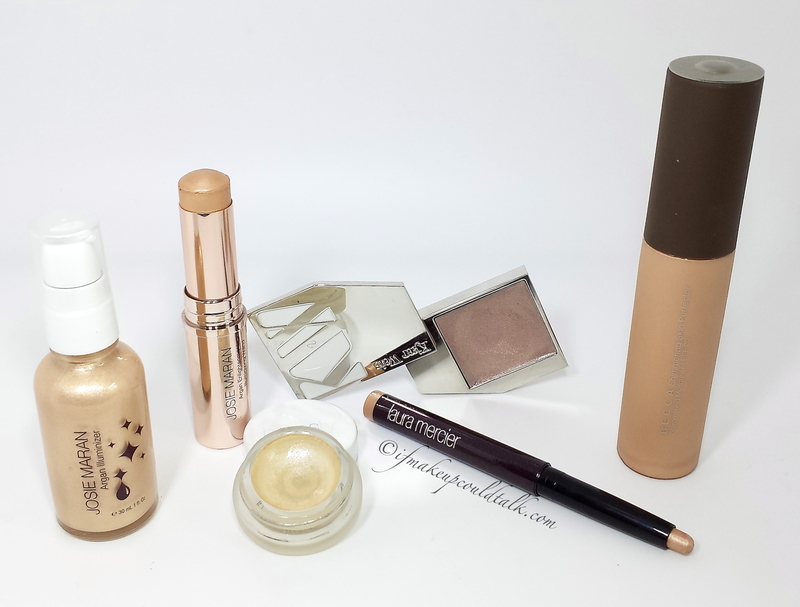 Josie Maran Argan Illuminizer, Josie Maran Argan Enlightenment Illuminzing Wand, Laura Mercier Rosegold Caviar Stick, Kjear Weis Radiance, RMS Living Luminizer, Becca Opal Shimmering Skin Perfector. 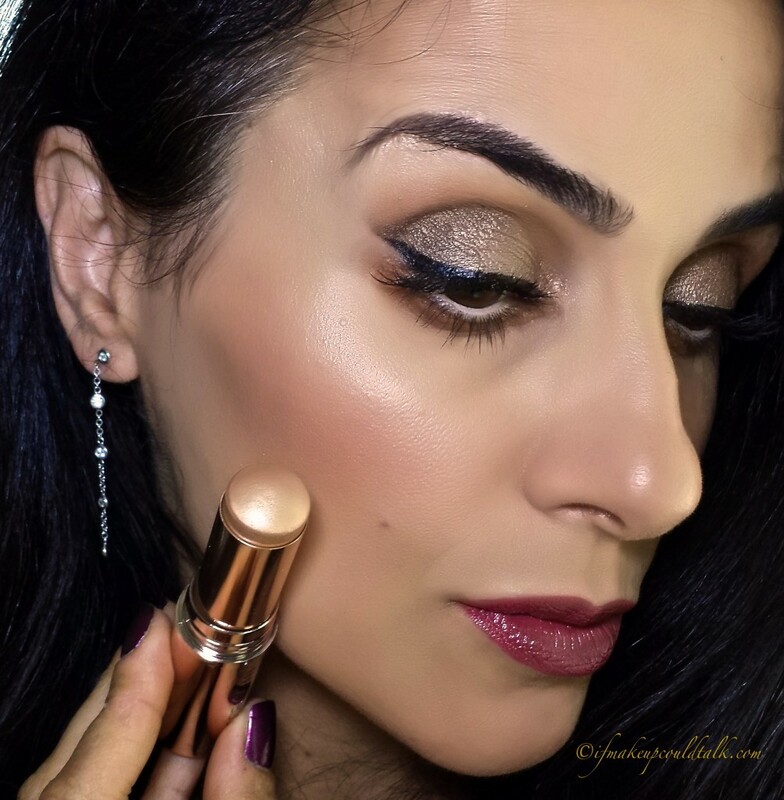 Josie Maran Argan Illuminizer is quite an intense golden highlighter. The dense liquid formula contains too much shimmer for my liking. Additionally, this older packaging dispenses too much product to be used for one application. The staying power is very good, but the messy application and highly reflective results do not make this illuminator a favorite. This product has since been repackaged as part of the Enlightenment Collection. 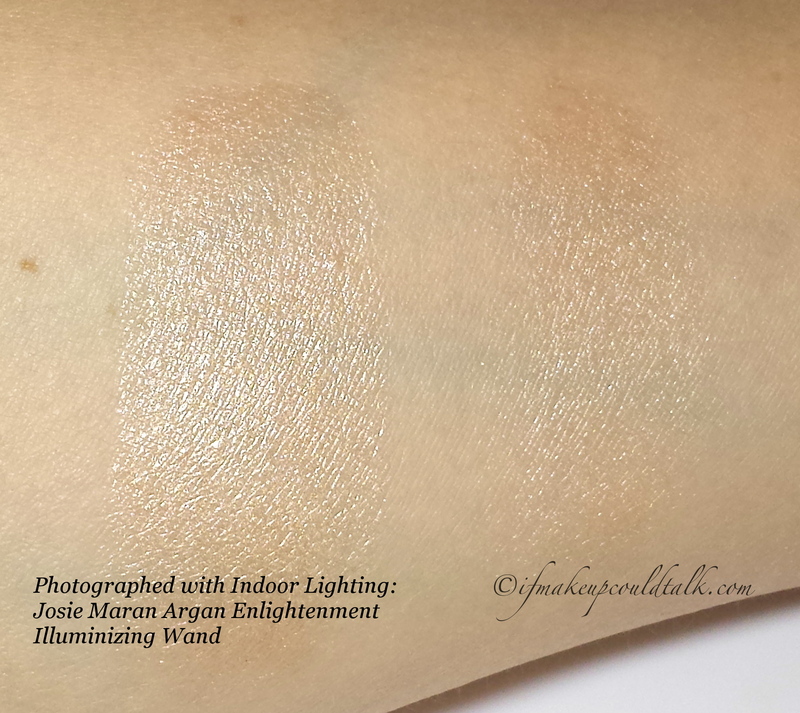 Josie Maran Argan Enlightenment Illuminizing Wand is slightly lighter in color than his liquid cousin, but the finish is so much more wearable and the application is quick and easy. Who wouldn’t want that? 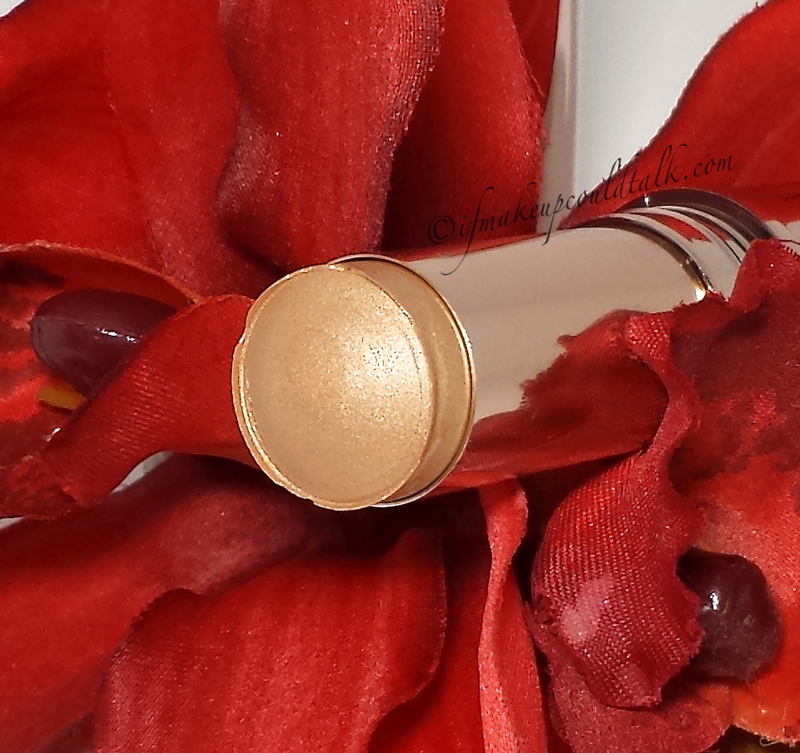 Laura Mercier Rosegold Caviar Stick is a warm rose gold color for the eyes. However, when applied with fingers, the metallic glow is perfect as a facial highlighter (read more here). Kjaer Weis Radiance is 95% organic and the coolest toned of the lot (reviewed here). 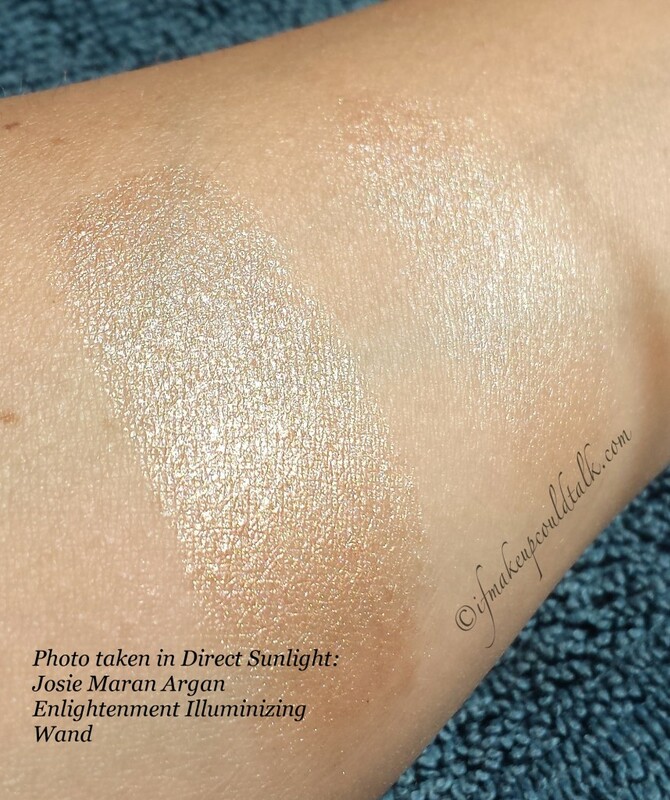 The price of this illuminator is quite expensive, but the finish is truly radiant. The lavender undertones suit lighter complexions beautifully, but may appear ashy on darker skins. RMS Living Luminzer is the sheerest of the bunch. The finely milled mica particles mixed with coconut oil produces the most natural sheen–oiler skins may not agree. Becca Shimmering Skin Perfector was made famous by Lisa Eldridge. I blindly purchased this beauty four years ago without researching the ingredients. This highlighter contains five parabens, mineral oil and a SPF fragrance. If these issues do not bother you, then the finish of this illuminator is gorgeous. Josie Maran Enlightenment Illuminizing Wand applied on the cheekbones and slightly under the brow. For the above photo, two light layers were applied. Each layer was seamlessly blended into the skin with my Wayne Goss 01 brush. 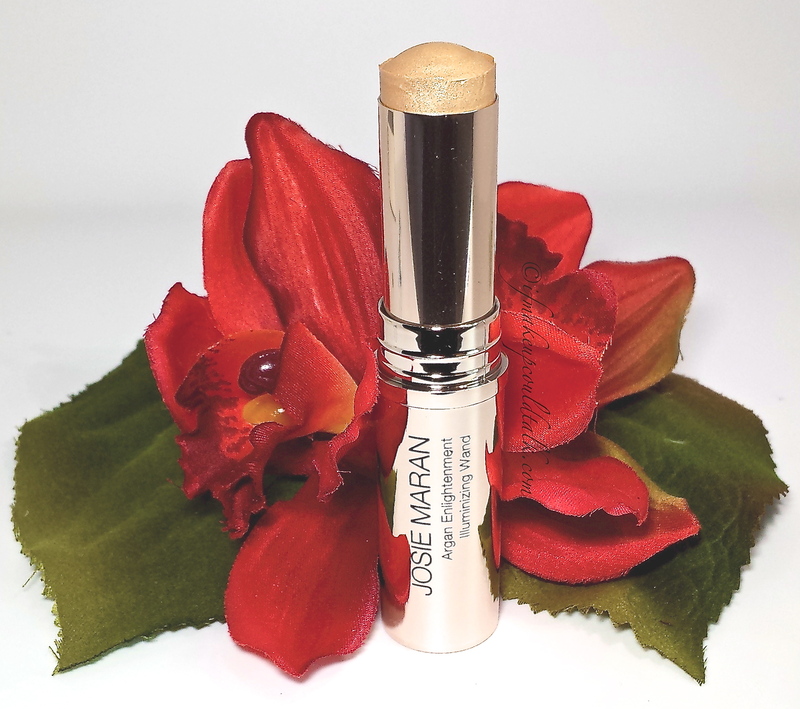 Makeup would tell you Josie Maran Argan Enlightenment Illumininzing Wand is a definite hit. The sizable amount, beautiful finish, flattering color and portability are sure to please a lot of people. Similar to a lovesick teenager, this highlighter is all I can think about using–that is, until a more attractive guy come a’calling . 🙂 Until next time, be well, stay safe and be happy. Laura Mercier Cavair Sticks in Sandglow (lid), Khaki (outer corners) and Rosegold (inner corners) (here). MAC Uninterrrupted (crease and lower lash line) mixed with MUFE Artist Shadow M-600 (here and here). Giorgio Armani Eye and Brow 2 Wenge Wood (here). Cover FX drops N-40 (1 drop) mixed with G-60 (2 drops) and NYX Shine Killer Primer (here). Giorgio Armani Sheer Blush 10 Beige (discontinued). Too Faced Chocolate Bronzer (here). Girlactik Allure Matte Lip Paint topped with Chanel Rouge Allure Gloss in Audace (here and here). Whiteflash Diamond by the Yard Earrings (here).